WARNING re: Yowies North America. I lost $350+. I would strongly advise members to either not purchase Yowies in the US or to purchase with a credit card only and be prepared to file a dispute with your bank if you have the same absolutely horrific experience as I'm having. If buying at all, I would first, without question, call the Yowie customer service number and ask what, if any, lot numbers are appropriately packed (And then I would not believe the information offered.). Thank you for receiving my mail. I have, very unfortunately, had to devote many stressful hours to this situation already and am hopeful that an e-mail to you or to Wayne Loxton's office will achieve a resolution. A friend provided me with your address when I asked her to obtain contact information for Mr. Loxton's office. While she didn't make it clear whether I'm ultimately sending the information for you to see or to forward, I appreciate your help. I am having a nightmarish experience with Yowie North America. I can provide as many details as necessary, but the bottom line is that I bought a full case of Yowies from Dylan's Candy Bar, the only store in the Northeast part of the US that carries them, and did not get anything close to that for which I paid. At the high price of $5 each (discounted 10% in my case for buying a full case), as opposed to the $3.50 charged elsewhere in the country, I spent over $350 on those figures (as well as approximately $50 getting to New York to obtain them). The product display boxes claim that what is contained therein is a collection of 24 natural replicas and shows only photographs of animal figures. In reality, I was later told, there are only 18 animal figures available and 6 cartoon character figures. Further, what I found upon opening them was mostly those characters, with only 5 of the 18 animals, duplicated of course. Upon calling Yowie North America, I was told by the representative--Jolene--that there was a distribution problem at the start of production and only a few animals were available, so the company compensated with large numbers of cartoon characters. After much (what I thought was needless) discussion, I was asked what I wanted, and I informed her that I only wanted that for which I paid--a random/fair distribution of 72 animal figures. She inquired as to which I received so that she could add to that mix without duplication and ended the call by saying okay, which she clearly intended to sound as if she was going to comply with my request. Almost a week later, I received 7 animal figures in the mail. Extremely stressed and angry, I called again. Ultimately Jolene said the company would send another 12 figures, which again, I found enraging. As I keep repeating, all I am requesting is that for which I paid which, according to the box, is only natural replicas, and, a fair distribution of those. I requested an e-mail address for the person who made the decision and Jolene seemed quite audibly afraid of providing it, and inexplicably instructed me to get it from the store from which I made the purchase. When I protested, she actually e-mailed the person, a vice president, for permission to give me his address. He complied while still on the phone. She refused to give me his last name and assured me that scott@yowie.com was the correct address. Despite sending him an e-mail yesterday, I have not received a response. I intend to call again today. There is no excuse for a company putting a customer through such an ordeal over such a long period of time, when it is acknowledging it is in the wrong. I spent over $350 and received 5 plastic animals with duplicates for that money. The company refuses to acknowledge the false advertising involved in the packaging and acknowledges but refuses to take responsibility for the distribution problem present in the lot from which I purchased. It is maddening that not one but two issues are at play here and the company is still unwilling to do right by a customer who put so much into patronizing it, but rather wants to toss me a few compensatory figures thinking it will silence a squeaky wheel with a baseless complaint. I paid for 72 fairly distributed animal figures. I am still nowhere near understanding why Yowie North America feels like it doesn't owe me that for which I paid. The only idea I have is that the company is assuming I am using the situation to obtain complete sets, which of course I do want for Christine and her friends. But had the two factors discussed not come into play, calculating percentages, I should well have expected to obtain multiple complete sets when buying 72 figures. That the company is putting such extreme amounts of energy into denying me something (at virtually no cost to it) when all the principles involved support me, the consumer, not it, speaks to a shocking lack of professionalism, integrity, and decency that I never would have expected from Yowie. At this point, I have such distrust for the individuals involved that if forced to honor my request by those to whom I am requesting help, I can't help thinking that the person involved would, despite it all being the same on the company's end, deliberately fail to offer complete sets. While this may be unfair of me to suspect, hopefully you can understand why I see the company in so very dim a light after all that has happened. That the company doesn't care that it is fostering this reputation is, independent of my issues, simply bad business. Once again, I am only asking for that for which I paid. I would appreciate the address for Mr. Loxton's office, your comments, and anything you can do. With apologies for the second mail, I just contacted Dylan's Candy Bar and was told by an assistant buyer there that the store contacted Yowie North American several times on my behalf and was told by the representative(s?) that answered the phone that Yowie will absolutely not send me more figures because the concept of the product is to buy, not knowing what you are receiving, and trade to get those missing. The company, once again, refused to acknowledge either the false advertising or even the admitted figure distribution problem. This is an absolute abhorrent, sick, unacceptable in every component situation. With further apologies, as I continue to address this, I made two attempts to reach Jolene at Yowie North America today so that I could inquire as to why I did not receive an e-mail from the vice president who gave her his address so that I could send said contact. So far neither call was returned. The woman who took the second call immediately acknowledged knowing who I was by telling me that Jolene already had my first message, and when she started asking me the basic questions required for message taking, I overheard her say to her coworker (who obviously knew my name and situation as well and I assume asked why she was indulging me, as if a directive not to had been issue), I'm just being polite. She denied making the comment when I informed her that I heard her do so. The extent of the lack of professionalism here, and the cowardice of those actually making the decisions, is astonishing. And I failed to mention that when the buyers at point of purchase Dylan's Candy Bar could not get Yowie North America to help, the employees there rallied to try to get me animal figures from samples or ones that had been opened in-store, and found, so tellingly, that it only had the same five animal figures that I already had. Gosh, I checked, are they these ones : http://www.yowiegroup.com/ ? Thankyou for passing your experience on ! Those are the ones. And I actually bought them for a friend in Australia. Andreas, you can see the figures in Susanne's link. That's a complicated situation for you with a remarkable loss of money. I hope you can manage a way to minimise it. Thanks for alerting us to that amd good luck. As I hear from more and more employees, I find that they are very well trained to parrot the company lines, with no regard for their meaning or for the truth. Cartoon characters are not natural replicas. Period. I don't think they understand the advertising laws in the US. We don't allow lying here. They certainly don't understand valuing customers. What happens when people start buying repeatedly to obtain the 19th-24th animals? What about children, especially? And I'm being told that I should have known that the animal figures I'd obtain in any one lot would be limited, as to them, collecting and trading is the point of the product. How exactly should I or anyone have known this? I'm not sure upon what they are basing this statement beyond what's in their own minds. Certainly nothing I can see in print or via any other means. Nor is there anything my friend in Australia can see as she is a long time collector and asked me to buy the case. And I've never seen a similar product in the US sold this way. Nestles Magic Balls. Wacky Packages, Trading cards. I'm wondering if it's legal. I'll for sure know soon enough. I don't like being cheated. It seems this new US Yowie series is still in some sort of trial phase with distribution. Valero Corner Store was one of the chains that sold Yowies at launch, but only in a few states to start with. My fiance happened to be traveling to one of those states, so I had him check around some of the stores. He found a store that apparently used to carry them, but is sold out now. The person working there told him it was only an August thing, but there could be leftovers at other stores. I guess it was just a test launch...? I don't know. Then, I read an article stating that Yowie will be available at Walmart in Texas, but only during October. They want to sell them nationwide eventually, if they sell well during that test. I am not familiar with product release and distribution and maybe this is a normal approach, but it is difficult to keep up with. It feels like a wild goose chase. Your experience sounds like a big headache! I think it is wrong to advertise 'natural replicas' when it's really mostly cartoon figures that are available. The customers had no way of knowing the full series wasn't ready yet. It is very confusing. Also, do they intend to continue selling them in this manner with only a few different animals per store and poor animal to cartoon figure ratios? How would children be able to trade with their friends, when they most likely go to the same store as their friends? I don't think this is a fair marketing strategy. And this is all aside from the fact that the Yowie characters have no relevance/context in this country at all. The only people who so far at least say that they believe this isn't fraudulent and terrible business are the Yowie reps making the decisions themselves, and they don't even have the backbone or decency to speak to me. You want a company to find success, hire employees, etc., but not at the expense of consumers. Tomorrow I'm calling Walmart Corporate Headquarters, Consumer Reports, and some government agencies. Brett, can You please share any photo of the animal (not cartoon) figures? Wow, I'm so so so sorry, I'd be irate if this is how they interact with customers. And such a shame, those animals are great. I wish you luck with this endeavor, please let us know how it ends (if this nightmare ever does ). I've never experienced such irresponsible, abusive, and especially, cowardly interaction with a company. Just to update in case anyone is considering patronizing the company. I just exhausted my last effort to get help. I've never dealt with a company whose reps actually universally refuse to communicate with you. This includes executives at Yowie North America and the CEO of Yowie International, Wayne Loxton, to whom I sent a request for assistance via regular mail. I reported the company to as many agencies as I felt appropriate, so at least there's a foundation laid so that maybe future customers won't have to deal with anything like this. Thanks for keeping us posted. The company does sound remarkably disinterested in its customers - I'm just sorry you had to find it out to your cost. I appreciate the public warning - it certainly does us other prospect customers a favour, and perhaps offers some incentive to Yowie to pick up their game. The company is, as far as I'm concerned, shockingly disrespectful of its customers. But the big point I want to make is for collectors to be careful when buying from it, particularly in large numbers. There is a candy store in my area called It's Sugar that has some things you don't normally see,including international candies. I went there today and noticed they had Yowie chocolates. I knew in the past they were known for having animal figures and on the box it showed very nice looking figures of animals like pandas and fennec foxes. So I bought two...but when I opened them I didn't get animals at all! All I got was two stupid monster figures that look simular to what the wrappers had. The chocolate was the worst i've ever tasted and I had to throw it out,it was just inedible. It was just a complete waste of $5 all around. 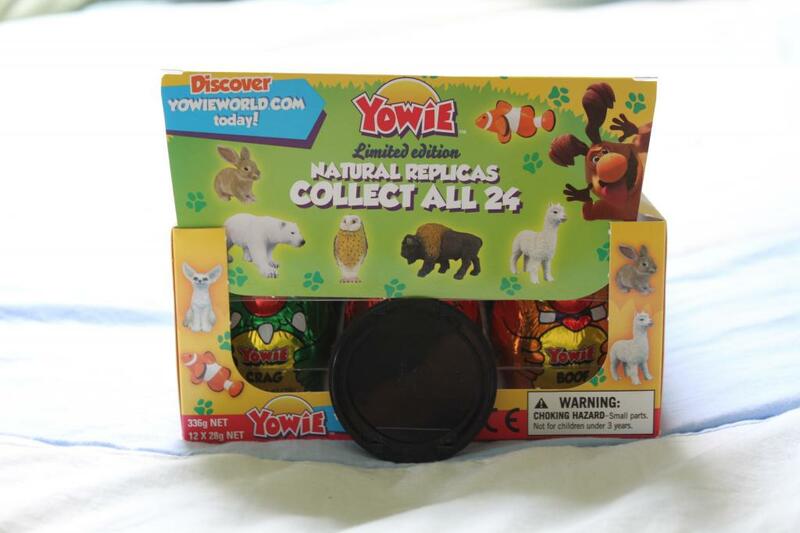 I was wondering-does Yowie not sell animal ones anymore or did I miss something? I'm really rather upset about this and I don't get it seeing as the display box made it seem like it was how it used to be. There's a thread about this, one second. I think this is the one? Yes Laura, this thread can help a lot although the way figures were acquired are different. Though, it shows that something goes wrong with that company. I just got two of the monster things,and the chocolate itself was absolutely inediable. I feel sick to my stomach after eating it-i've never tasted something so bad. I'm really upset that you are almost guaranteed not to get any animals. Is there a customer service email I can complain to? The taste alone is enough to complain about. All of the websites appear as down for me. Please do contact them! PLEASE! Here's the page with the e-mail and phone number. Please tell me what happens! Do you have a consumer's ombudsman in the USA ? Is a Ombudsman something like that of a consumer protection agency? I think something like that might be around if so. And yes,definitely. I just get a white page that says "Error 400 Bad Request." whenever I try to click that page. Is the website even up and running anymore? Link is working correctly with me. an official appointed to investigate individuals' complaints against maladministration, especially that of public authorities. Please consider calling. I'm very curious to learn how you'll be treated and if you'll get results. I would love to see others here do the same if they are unfortunate enough to have this happen to them (not that I'm wishing that on anyone...). It's my thought that Yowie has a corporate wide lack has ethics. It's unheard of in my experience for a company rep--particularly one at a supervisory or above level--to simply ignore a communication, and that's what happened with not only a supervisor at Yowie North America but the actual CEO of Yowie International in Australia. Of course they have no viable answer to my complaints so that could be why they don't want to say anything. To update though, a supervisor did respond to a complaint I made via a government agency and that response was forwarded to me. In it, the supervisor unwittingly acknowledged the problem and still indicated that the company feels it owes me nothing. I pointed this out to the agency rep and asked to have the issue taken up again. I'm getting irked enough hearing of the continuing madness by Yowie to actually wish we had a store here selling them. I'd like to buy one to doubtless get disappointed with so as to have cause to contact them, too, and let them know what I think of their game. Again, Brett - and now Shadoweon too - I'm sorry (not to mention rather pissed off) to hear of this happening to you. Yes,you are right with regards the chocolate-it's pretty awful!! !The models that were inside,you had to take your chances!You could get a nice model animal or you could also get a Yowie monster as has happened to me when I use to buy them in the past,so it can sometimes be a waste of money and time especially when you are expecting a model! It didn't say anywhere on the box or package about getting something other than an animal so :I. I won't ever buy from them again but i'm upset that it was literally $5 in the trash. This evening I looked at the Yowie web site and it changed its content to reflect the truth I've been espousing over the past months. So the company is taking my point, acknowledging its false advertising, but still refuses to compensate me. Unbelievable lack of integrity but oddly a bit satisfying. The company never responded to my email to them complaining about this issue. I wrote a second letter to the CEO of the Yowie International telling him how the company's website changed its facts to eliminate the deceit about which I've been complaining for months and yet still it won't take responsibility for it, and I again received no response at all. It seems to me a grotesque company with, surely, some unbelievably irresponsible and cowardly management. Also, the website indicates that Pennsylvania and New Jersey (where I am) Walgreen's (a US drug store chain) stores were supposed to have begun carrying Yowies at the end of November and neither of three stores I checked nor anyone at Corporate headquarters with whom I spoke (only because my friend in Australia for whom I originally bought them still wants to complete a set) know nothing about them. And sorry you didn't get any satisfaction either. To update, I just bought a carton of 12 Yowies from a local drug store here in NJ (It is test marketing them.) for my friend and she received all duplicates--no figures that were different from those contained in the case of 72 I bought originally. Subject: Re: WARNING re: Yowies North America. I lost $350+.